See the video review to get more details. Do you want your store to comply with the latest EU’s legislative requirements? Try out our Magento GDPR module to be sure everything's fine. Why do customers leave their carts? According to the Sale Cycle, the average abandonment rate in the sales sector is over 73% and the overwhelming majority of abandonments happen in the time period between 1 pm and 2 pm. Very often online shoppers add products to their carts but don’t complete purchases because of hesitation. Remove the hesitation with the Magento 1 Abandoned Cart Emails extension by getting closer to clients and boost your sales. Do you know that according to the latest statistics every single shopping cart reminder sent to non-converted customers brings about $5 back to the online store? In a highly competitive e-commerce market, you simply can’t afford to ignore potential profit which could be generated by abandoned carts. Show to your clients you highly appreciate them by offering tempting discounts in your Magento abandoned cart email. You can easily personalize your reminders and therefore get more powerful feedback. Display product configuration options like size, color etc. Insert discount codes into any of the follow-ups so that store visitors will be highly motivated to come back and purchase the items from their abandoned carts. E.g. you may send 3 reminders to a customer and add promo codes to the 2-nd and 3-rd cart emails to increase the chance of order. Different products require different approaches to be sold. Clients who are going to purchase expensive products, for example, cars or jewelry, require more attention. So, you can create a special rule for such types of products to send more follow-ups and promo codes to potential clients. Create an unlimited number of flexible rules to send as many follow-ups as you need. For each rule you can set an individual number of follow-ups to be sent, e.g. for simple and cheap products, it may be 2 reminders, for more expensive ones it may be 4 or 5. If you are going to send more than one email you can indicate any time periods between the dispatches. Motivate customers to return to your Magento store and complete their purchase with discount coupons. 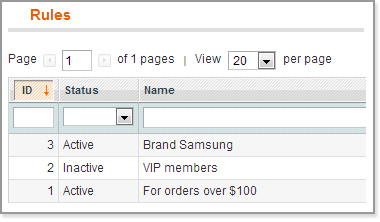 Specify conditions when the promo coupons should be automatically sent to clients. Usually, visitors are not likely to register on shopping sites, so it’s very important to have the ability to send follow-ups not only to authorized visitors but to guest cart abandoners as well. The module captures guest addresses with AJAX when visitors fill in the checkout fields to send them follow-ups in case they interrupt the checkout process. The dispatch automatically stops when customers click on the "restore cart" link or in case any product in the cart is out of stock. After the order is placed, follow-ups won't be sent as well. It’s possible to enable, disable or delete rules in bulk. An admin user can apply these actions to any number of rules right from the grid in your backend. While creating a rule you can specify customer groups, order amount, particular brand names etc. Such flexibility will help you to effectively set up mass email sending by accurately targeting it. Use new condition to track how many carts each particular customer has restored this month. Due to this option, you get even more precise recovery data and prevent abuse from shoppers who abandon their carts too often. To take the coupon usage over total control make the promo-code sent in the follow-up email valid only for the email recipient. History grid shows who of your clients just opened a recovery link, recovered the cart as well as whether they used the attached coupons or not. Filter and sort the data by rule name, customers’ names and emails, status, etc for effective analysis of your campaigns. For a proper analyzing a store, admin can also export the detailed history of all non-converted carts. The module enables you quickly view, edit and import customers' emails blacklist. Add customer addresses to the list either manually or by uploading them from your computer. The module allows you create test notifications and send them to the appropriate address to check if everything functions correctly. Disable auto sending option and manage follow-ups manually. Stop sending emails once the recovery link is opened. Send a reminder copy to an alternate email address. Send follow-ups to registered clients only (not guests). Before a follow-up is sent it gets into the sending queue where you can see all the sending details and edit content. Modify the scheduled date and time as well as the customer's email address. You can also edit templates right from the queue grid. The extension fully supports the One Step Checkout module functionality allowing you to easier capture customers' email addresses and launch effective email campaigns. To see how Abandoned Cart Email module works please watch the video review. Decrease email rejection and prevent your abandoned cart emails to be labeled as spam with Magento SMTP module. What’s required for the extension to work? For correct work of the module you will need to set up a cron job. Read more about Magento Cron. Only one abandoned cart at a time is supported. Read on to see all the details. One customer can recover a limitless number of abandoned carts by default. Though, using the abandoned cart settings you can restrict the number. Read on to see the settings. Yes, Magento Abandoned Cart extension allows for sending guest emails to not registered visitors and visitors uncompleted a purchase. Does AJAX email capture work with One Step Checkout extensions? Our Abandoned Cart Email module is compatible with the overwhelming majority of 3-d party extensions. But in case any issues occur - our support team will instantly help you to solve them. The module is 100% compatible with our One Step Checkout extension. Does abandoned cart email contain pics of the items in the customer’s cart? Yes, sure, product images will be automatically added to the email. Are there any ready-to-use email templates? Yes, you will get a ready-to-use templates in the extension package. Additionally, you can create as many email template styles as you need. There are also advanced options that will make your emails even better: it’s possible to display variables like size, color, etc. as well as use format manager to display currency, dates, price and time. Can I send a coupon code in a reminder email? Yes, you can create rules according to which coupons will be sent. Magento email notifications can be disabled automatically. For this, you need to set cancel conditions in the rule configuration. Go on reading to see the example. Can I have different rules for reminders in different store views? Yes, each rule can be applied to all or only some store views. 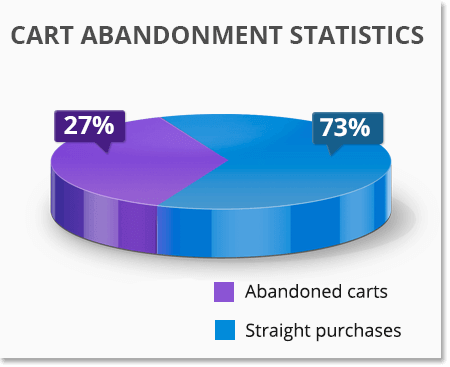 Yes, you can track the shopping cart abandonment statistics. With the use of Google Analytics, you can receive Magento abandoned cart report. To see the screenshot go on reading. Debug mode is a useful tool that allows you to check why emails are not being sent out. Please proceed to the full answer to get a step-by-step guide. Hi. I recently bought this extension, as an addition to Follow Up email. OK. it could be just one extension. but nevermind. Extension works almost well, rules are robust. you can make chain of messages etc. 1. coupon code is not applied when customer is clicking link email. Customer is logged to the store, its session is handled, so why not to apply email coupon at once? Extension is great and support is even more great! The extension works great for me and the support helped me a lot in installing the extension. Must say you can freely choose Amasty products they are good with there products and support. I write reviews very seldom. This time I’m just happy with the extension, and delighted to say a few words. It’s an excellent email trigger with multiple options and opportunities. It took some time to “play” with all of them. The number of features, possibilities and customizations is amazing! Actually, sending out the first bunch of emails I was afraid that clients will mark this mail as spam. Instead we’ve received a positive feedback; the clients came back for actual purchases. We recovered a lot of abandoned cart with this plugin. E-mail templates are also worth noticing, they look really good. But if you want to create your own template, you’ll have to figure out how to do it. It would be nice if this feature becomes more intuitive and user-friendly. So I can tell for sure that it's a great idea for that price. Generally, it’s one tool to earn more without any extra work. one of the best email trigger modules so far. Lots of options – everything nee ded for sending emails and tracking them. No conflicts with other extensions as well. Although you can customize the templates and add various product parameters and stuff in it, it would be much easier if there were a couple of decent email templates – but we had to design them and code them so they look good. With this option it would be an all-in-one solution saving our time. Excellent email trigger with wide functionality! Most of all I use promo campaigns based on customer wishlist and previous orders. It took me a minimum of time to set up email trigging but the results I got are beyond words. One thing that made me a little bit sad is the design of email templates. I expected something more. Yes they’re customizable but I wanted ready cool-designed templates. Overall, this is a great module and will be even better once they made the above mentioned improvement. Just a good addon for retargeting, very well thought out. Our worry that customers wouldn't like receiving abandoned cart reminders proved to be unfounded. We have already seen a clear ROI in the first 2 weeks. So, the addon is exactly what they promised, plus excellent customer support. 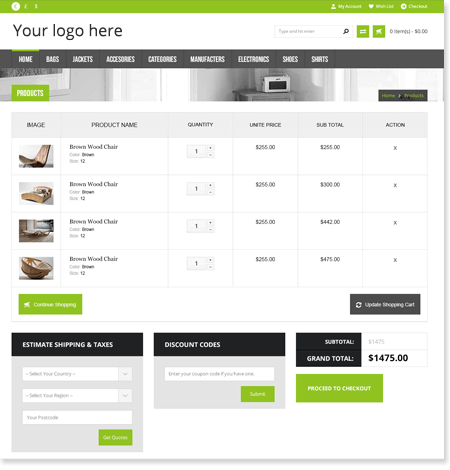 Easy installation and highly customizable extension for re-marketing. This extension is a great tool to follow up potential customers. I had some problems with sending emails at first but Amasty support helped me out. Good job! This extension allow our store to send mail for each group of customer with conditions. This extension allows to integrate an excellent re-marketing solution. It also comes with a nice mail theme that, in most cases, can be used as is. This extension works exactly as it's described on the product page. But I couldn't find out the way to create email templates by myself and had to contact Amasty support. After the guys helped me I had no problems with the plugin and I'd definitely recommend it to others. My boss is happy with the module. Easy to use, handy tool to remind customers about the carts they abandon. You now, we really didn't expect that this would increase our conversions rate so quickly. Amazing results! Another good extension from you guys! Powerful configuration compared to competitors. Some pre-defined e-mail templates would be great! Another suggestion is to be able to send coupons that loss their cost with over time. For example if customer comes to proceed with his order within 1 hour after abandoned e-mail is sent, he gets 20% off. If he comes after a day, he gets only 10%. – Fix: issues related to discount price were fixed. – Fix: url issues related to child and parent products were fixed. – Fix: the error message appearing in Queue menu under very specific circumstances was fixed. – Improvement: now extension is able to log errors which occurred during email preparation into log file. – Improvement: now placeholder image will be sent if product doesn't have an image present. – New: it is now possible to output Discount Amount of abandoned cart coupon in email. Please look for 'Coupon Discount Amount' in 'Insert Variable...' menu when editing email template. – New feature: Debug Mode. 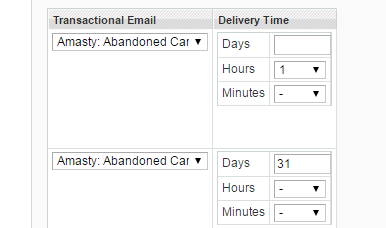 When enabled, carts will be immediately marked as "abandoned" and email will sent with zero delay. – Option to to send alerts to registered clients only. – Compatibility with SMTP extensions. – History for deleted schedule is now also visible.